Coko (CHO-co) washing station is located in the highest parts of the Gakenke District and run by the small, mainly female Twongerekawa Coko cooperative society. 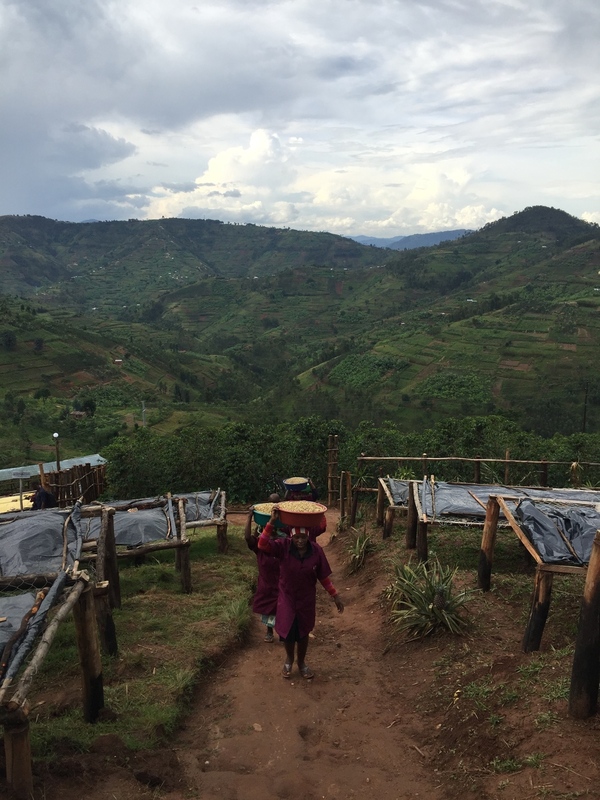 Coffee from Coko is from an unusually high altitude (2000+ masl), which translates into slowly ripened, juicy beans that have both a typically Rwandan black tea-like finish and sweet taste notes of ripe citrus. Over the past years, this coffee has become a classic for roasters around Europe, and they managed to create such popularity around the coffee so as to attract many other buyers in the last few years. As a result, since this year, Twongerekawa Coko managed to sell all its coffee to buyers who promote the coffee at CWS level - an increase of 40% since 2014! After creating three village lots in the 2017/2018 season, decided it was time for a change after years of just creating fully washed lots. With the aid of Abakundakawa and Misozi, They tweaked and perfected their first honey processed lot in 2018, which is an astonishing combination of washed and natural flavours. Since 2016, we are pioneering village lots by separating the coffees from our two favourite collection point lots on the cupping table: Gitaba and Kavumu. Organically produced (not certified), emphasis on women empowerment. 2017: instead of one coop "blend", we created three village lots: Gitaba, Buhuri and Gitambi. 2018: After years of perfecting the washed lots, Coko has taken the bold step to innovate in their processing: they have created their own style of honey process. fully washed and double fermented: all coffee is hand picked, depulped, dry fermented for 12 hours, then wet fermented (18 hours), washed with mountain water, shade dried, then sun dried on raised beds. the price you pay for the Coko Washed p/kg. This Side Up pays $ 7,10 to Twongerekawa Coko (FOT Kigali), which is 2,27 x the Fair Trade base price. We agreed on this price directly with the farmers, disregarding the volatile US Coffee C price. the price Twongerekawa pays farmers for their cherries as p/kg price of green (milled) coffee. This price is often unknown to buyers. The extra €1,68 is our premium that was invested in expanding Coko's drying bed capacity (2014/2015), a new pulper (2015/2016), five cows (2016/2017) and general maintenance (2017/2018). This Side Up compensation for spending time and resources importing this coffee. Our work includes building relationships with shipping and warehousing partners, managing export, import and shipping bureaucracy, Q grading, sampling and jointly promoting this coffee with Misozi and Twongerekawa Coko. We use the profile we developed for the washed Rushashi lots for Coko. For the honey washed lot, we use Fuadi Pitsuwan’s Thailand Saket Honey profile. You may use these images freely to promote Coko among your customers. Felicien is the manager of Coko's wet mill. He is a progressive entrepreneur with a background in agronomy and is has run the wet mill and managed upgrades since 2016. English and French speaking. Coko is the only washing station owned by the cooperative society Twongerekawa Coko. This coop's management is made up of twelve members: 8 women and 4 men. All of them are professional cultivators. The mission of Twongerekawa is to alleviate poverty among the 800+ smallholder farmers in the area, with a special focus on women. Their professional and agronomic background has inspired them to use a water-saving Colombian machine washer rather than more conventional fermentation methods. Even though Coko is located so high up in the mountains where running water is expensive - itis now able to rely fully on naturally collected mountain water for its fermentation and is in the process of obtaining full organic status. 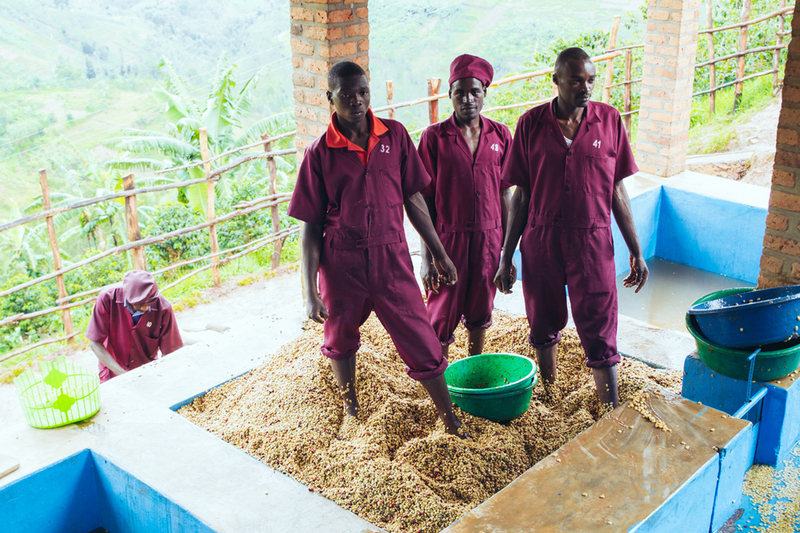 Their expertise has also allowed them to train smallholders to increase and improve their yields, and Coko is thus able to collect over 300 tonnes of high grade coffee from small plantations all around the washing station. Their results in the cup have been deemed impressive (and even scored 90+) by some of the world’s most prominent roasters such as Sweet Maria’s. Twongerekawa also holds regular meetings in which women smallholder farmers are encouraged to share ideas with the coop’s members that could contribute to better livelihoods. It is encouraging to see so many initiatives in Rwanda being directed towards women empowerment - not just from a humanitarian point of view but, perhaps more pragmatically - because equal treatment, training and ownership increases overall income for all smallholders. This washing station is built in an area with enormous specialty coffee potential, but when we first visited it was at full processing capacity. There is not much space to expand Coko’s drying bed capacity naturally, because of the steep slopes in the area. To expand, they must invest heavily in wood and sturdy construction, which This Side Up’s premium was reserved for after the 2014 harvest season. 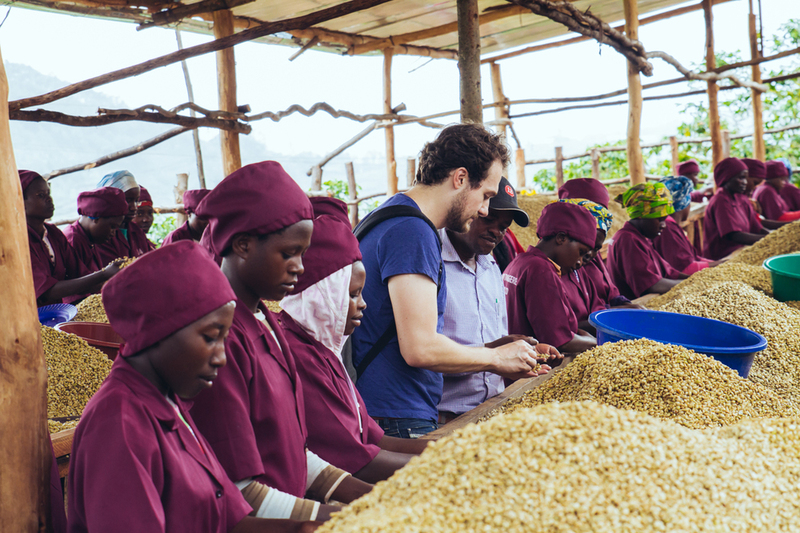 Coko’s 2014 crop has become a favourite among our clients, and we’ve been able to procure so much of their harvest that the premium of +1,87 p/kg could entirely finance the expansion of the coop’s drying capacity. These all-important drying beds are an example of how a small investment can lead to large growth. The beds eliminate a large bottleneck in Coko’s processing chain: they make it possible for them to wash and dry more coffee simultaneously, meaning more coffee can be sold as specialty coffee and less will be wasted and defected. We saw the new beds put to use in April 2015, the start of the harvest season. More Coko coffee for the world in 2015 - and higher income for all member smallholders! Demand for Coko's coffee this season is unstoppable: three weeks after our shipment arrived in October, Coko is completely sold out. Another great fact is that because of our online promotion, Kickapoo Coffee from the US got in touch with us and bought Coko again after three years. They too paid a large premium and bought even more coffee than we did, so Coko was able to sell a record amount of its coffee directly to foreign buyers. This is true development through openness and we're loving the results! We worked together with Misozi and Coko to pioneer a simple but far-reaching innovation: keeping the coffees separated from our favourite collection points (that correspond with villages). This year, we created a "village lot" from the cherries from Gitaba and Kavumu only. We hope that by promoting the coffee at village level, the coop can further investigate the origins of desirable traits in the coffee, cross-evaluate lots and allow both agronomists and farmers to spread their trait secrets across the coop's full membership base. This year, the coop's members decided to spend our premium on five cows. Milk represents the main source of protein for Rwanda's smallholders - and cow manure, along with organic compost, is the main ingredient for the coffee trees' fertilisation. We hope these bovines will live long lives serving this and the next generation of Coko's farmers. Coko has once again been able to attract direct buyers from all over Europe who eagerly awaited their crop. It is still the record holder for our coffee that returns most frequently on our partner roasters' menus. This year, the coop has further developed the village lot concept by not mixing the two village lots from last season (Gitaba and Kavumu) but separating three villages carefully: Buhuri, Gitaba and Gikamba. We cupped all three during the harvest and noticed enough regional variance to import them separately and gauge which characteristics appeal most to roasters. The Buhuri exhibits a less citric type of acidity (more kiwi-like) which we found very exciting, whereas the Gikamba is the most floral. The Gitaba has the deepest, fullest sweetness, reminiscent of banana. Because we offer 30 kg bags, we love that the fans of the Coko cooperative are trying out all three villages - and we're collecting feedback as input for next season as we speak.